Yesterday news broke that a Google Home Mini speaker had gone rogue and started recording everything that was being said around it – not the way Google's smart speakers are intended to work, and not the best way to earn the trust of users. 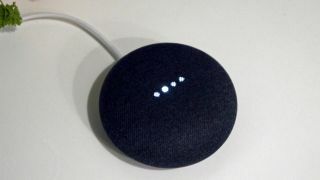 It seems the issue only affected a select number of devices, but now Google has turned off the ability to tap the top of any Google Home Mini to issue a voice command, which should be enough to stop the bug from rearing its ugly head. The "OK Google" command can still be used to 'wake up' the speaker. Google Home Minis aren't actually in the wild yet (the faulty device we reported on yesterday was being reviewed by a reporter from Android Police), and Google is hoping to finish rolling out the update by October 15, a few days before the speakers officially go on sale on October 19. What was supposed to happen is that you could tap the top of the tiny speaker (or say "OK Google"), and then issue your command. For some reason a limited number of Google Home Minis were detecting touches constantly, and always listening for and processing commands, sending snippets of recordings back to Google around the clock. You can still tap the top of the speaker to control the volume and mute the Google Home Mini, Google says. Whether the tap-to-talk functionality will ever return with a future software update or hardware revision remains to be seen. "The Google Home team is aware of an issue impacting a small number of Google Home Mini devices that could cause the touch control mechanism to behave incorrectly," explains Google. "We immediately rolled out a software update on October 7 to mitigate the issue."